America, land of the free and home of the brave! Also, home of the hamburger, baseball and the oddity that is the roadside attraction. From Route 66 to the backwoods of the South, America’s roads, freeways and byways are dotted with attractions, signs and buildings that make our country great. Here are the Top 10 Signs you found roadside America. 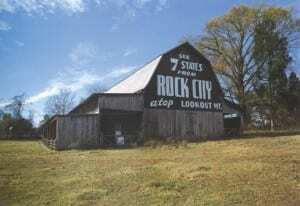 At one time, from the Great Lakes to the Gulf of Mexico, there were over 900 barns expertly painted with the words “SEE ROCK CITY” on them. Although there are less than 100 left, these roadside “signs” still point the way to Lookout Mountain in Chattanooga, Tennessee. Hand painted by Clark Byers (and his successor Jerry Cannon) since 1935, these beautiful signs were the brainchild of Garnet Carter. Carter wanted to attract visitors to his unique property and used the barns to capitalize on the growing fascination that Americans had with car travel. Today, over 500,000 visitors come to Rock City to see the 10-acre area that features unique rock formations, caves and gardens. What do you do when you are an office supply company and you have a vacant lot next to your building? Build the world’s largest office chair of course. In 1981, that’s exactly what Leonard “Sonny” Miller, owner of Miller Office Supply in Anniston, Alabama did. 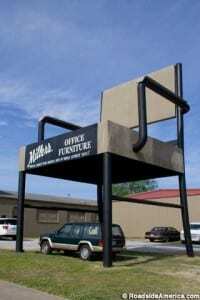 In 1982, Guinness World Records officially dubbed the chair the world’s largest. Although larger chairs have been built since and, for a time, Miller moved the company to another part of town (they have since moved back), the chair still stands and acts as a great photo opportunity for residents and visitors. And, if you really like the design of the chair, you can still go next door and order the actual, regular sized, version! 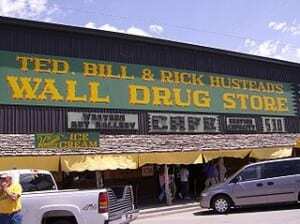 Wall Drug is a not-so-little store located in Wall, South Dakota. The shop gained notoriety in the 30’s when they started offering free ice water to parched travelers on Route 16a as a way to get patrons to stop. The idea worked (they claim to give away 20,000 cups of ice water a day during the peak summer months) and now Wall Drug features a cowboy themed shopping mall, chapel, Western art museum and 80-foot dinosaur replica. In 1981, Time magazine declared the store the nation’s largest roadside tourist attraction in the North. Today, from Minnesota to Montana, you can see the hundreds of signs, billboards and advertisements directing visitors to Wall Drug. Jim Reinders was an artist and sculptor who studied the original Stonehenge while living in England. For years, Reinders wanted to copy Stonehenge. Who knew he would do it with 38 automobiles, spay painted grey to match the look of rocks? The sculpture was built as a memorial to Reinders’ father and located where his father once lived on a farm. The memorial took 5 years to complete and was dedicated on the Summer Solstice in 1987. 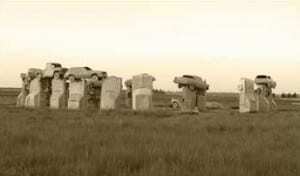 Today, the site of Carhenge, located in Alliance, Nebraska, has been donated to a local group to manage and care for and has had a parking lot and other amenities added for visitors. Apparently, Americans have a fascination with beater cars turned into pieces of art. 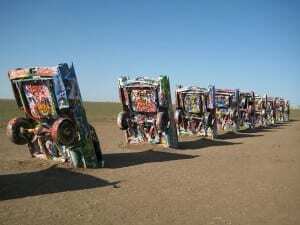 The Cadillac Ranch in Amarillo, Texas is a public art installation by Chip Lord, Hudson Marquez and Doug Michels to commemorate the evolution of the Cadillac between 1949 to 1963. The cars are installed at the exact angle of the Great Pyramid in Gaza. Over time, the cars have been painted and repainted for various reasons. In fact, tagging the upside down Caddys is encouraged. Last year, Hampton Inn attempted to restore the cars to their original colors. With all the pomp and circumstance of a great PR campaign, the cars where restored and a plaque commemorating the event was erected. Not surprisingly, the cars and plaque had graffiti all over them in 24 hours. When John Milkovisch, a retired upholsterer for the Southern Pacific Railroad, decided that he was “sick of mowing the yard” in 1968, he started a 2 decade long project that transformed his house in Houston, Texas into a roadside attraction that is a must see. Covered by strands and strands of cut beer cans, the house not only looks cool, it’s practical as well. The estimated 50,000 cans actually lowered the house’s energy bills! After the death of John and his wife, the house was acquired by The Orange Show Center for Visionary Art where a restoration project is currently under way. You can visit the Beer Can House and explore the property on guided or self-guided tours. 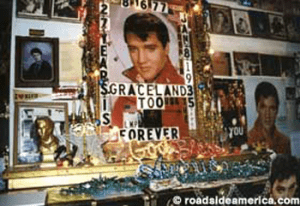 Halfway between Tupelo, Mississippi, the birthplace of Elvis and Memphis, Tennessee, the resting place of Elvis, sits Holly Springs, Mississippi, THE shrine to Elvis. Dubbed Graceland, Too, the two-story home of Paul McLeod has become synonymous with the beloved singer and actor. Open 24 hours, the shrine is the town’s biggest tourist attraction. Between the diehards and the drunk college kids from nearby Ole Miss that show up at all hours of the night, Paul says he doesn’t get a lot of sleep. The best part about the “museum” is that after your 3rd visit, you are automatically added as a lifetime member, complete with free admission until you go meet Elvis yourself, a membership card and a picture taken in a jacket once worn by the King. Think “London Bridge is Falling Down” is just a nursery rhyme? Think again. The bridge did fall down, sort of. In the middle 20th century, the actual bridge, constructed in 1831, couldn’t handle the traffic load of a modern London. 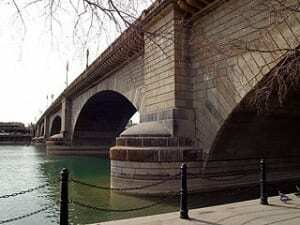 So, the bridge was sold to an Arizona oil baron, who paid almost $2.5 million to purchase it and another $7 million to have it moved to Lake Havasu City in 1971. According to Guinness World Records, it’s the largest antique in existence. 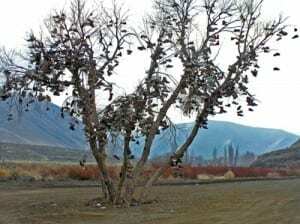 Is there anything more random, more pointless, more…….. interesting than the shoe tree? I love what Roadside America’s website says about the trees. “Shoe Trees may be the greatest embodiment of the American Spirit you can find on the highway” and the great part is, they are all over. They don’t exist for profit and they weren’t some crazy promotional idea to attract customers. They’re just trees that at some point became the final resting place of someone’s kicks. And, then someone else decided to make sure the single pair had company. The rest is history. Unfortunately, many shoes trees have been lost to weather, idiots with chain saws or other forms of vandalism. So, if you come across one while traversing these great states, stop for a moment, get a picture and summon your inner hippie by ditching your shoes. If you do, you’ve just added to the wonderfulness that is the roadside attraction! 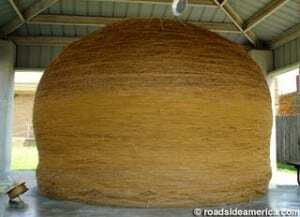 What Top 10 list on roadside attractions would be complete without the obligatory “World’s Largest Ball of Twine?” And, who knew there were actually two twine balls competing for world’s largest? The ball located in Cawker City, Kansas is actually a work in progress, having become somewhat of an obsession for the town of a few hundred. Each year residents and visitors add to the ball during the annual “Twine-a-thon.” Sounds riveting right? If participation is not for you, you could try the world’s largest ball of twine created by a single individual, located in Darwin, Minnesota. This version comes complete with its own glass gazebo display case and “Twine Ball Day” celebration in August.